This beautifully elegant 9 carat white gold ring features diamonds totalling 2/3 carat in weight set into a square cluster on the head and set into the shoulders. The main cluster of stones are also shouldered by a stunningly intricate rose gold crosses, framing the diamonds perfectly. 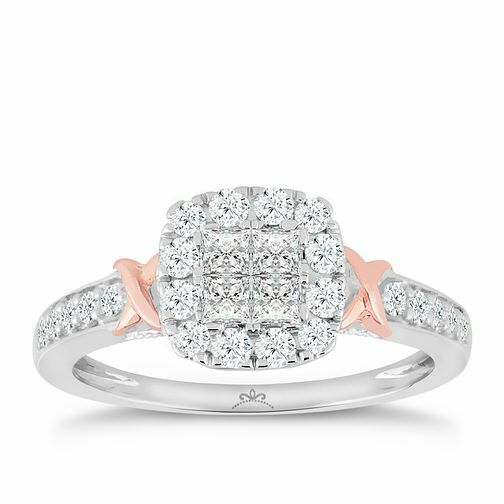 Princessa 9ct White & Rose Gold 2/3ct Diamond Ring is rated 5.0 out of 5 by 1. Rated 5 out of 5 by Anonymous from Absolutely beautiful. My boyfriend proposed to me with this ring last month and I absolutely love it. Pictures don’t do it justice. Absolutely perfect. He paid full price so it’s an absolute bargain at the minute!